During March 26-28, 1862, Union forces defeated Confederates from Texas in the significant Civil War Battle of Glorieta Pass. The heaviest fighting occurred at Pigeon’s Ranch, March 28, the hacienda serving as a temporary field hospital with many of the dead buried on the ranch lands. A Missourian of French descent, Alexandre Pigeon or Valle (he used both names in New Mexico), was a successful Santa Fe Trail trader who established a sheep ranch and wayside stop in the 1850s. Located in a tight canyon near Glorieta Pass approximately twenty-five mile east of Santa Fe, the ranch complex straddled the trail. The main hacienda was a rambling single story, rectangular building of over twenty rooms with a shallow pitched roof. Trees shaded an interior patio. Outbuildings, stables, corrals, and well house surrounded the hacienda. The structure also served as a stage-stop and a trail-side inn. The ranch deteriorated after Pigeon’s death in the 1870s. After the construction of the Atchison, Topeka & Santa Fe Railroad through the pass, in 1880, traffic was diverted away from the trail in 1925, Thomas L. Greer bought the “Old Pigeon Ranch” where he opened a store of curios, postcards and other sales items for tourists along what was later designated U.S. Route 66. He published a brochure describing the hacienda as a “Spanish fort” and the well as “Coronado’s Well.” The curio store and roadside attractions remained in operation into the 1960s. Greer died in 1968. State supported archaeological surveys mapped the site in the 1970s and 1980s. Stabilization of the remaining adobe structure, part of the original hacienda, occurred in 1978-9. 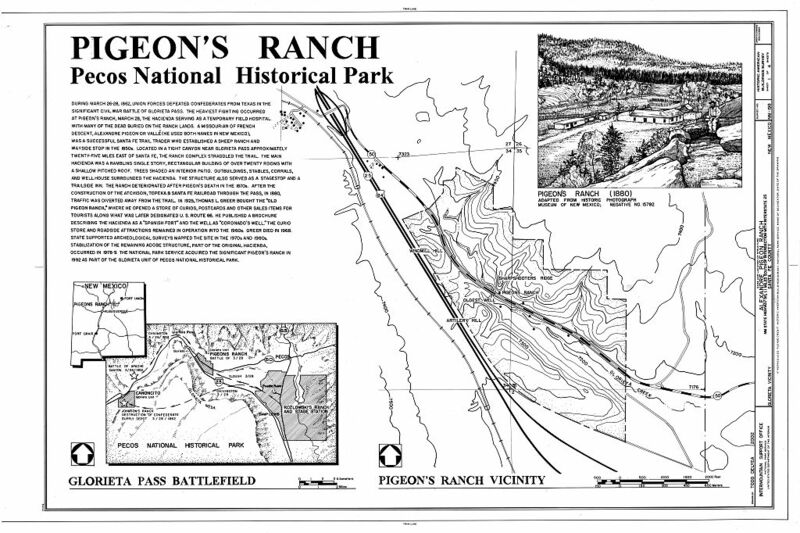 The National Park Service acquired the significant Pigeon’s Ranch in 1992 as part of the Glorieta Pass Unit of Pecos National Historical Park. This document was complied after 1933. This is part of the Historic American Buildings Survey/Historic American Engineering Record/Historic American Landscapes Survey Collection at the Library of Congress.